And I’m Done! I present to you all: Lunar Frenzy! Well, unfortunately (or not) I won’t be near a computer from now and until the end of the competition, forcing me to scale back my project. 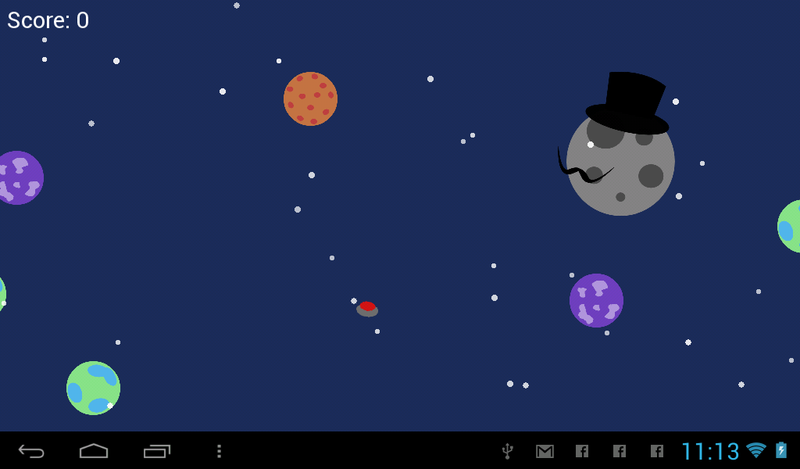 However, I’m still very proud of it, as it’s entirely playable, both through Flash and Android devices! The game was made with touch controls in mind, so I strongly suggest you play the Android version if you have the chance. All comments are extremely appreciated! And don’t forget to post your highscore! Feel free to check it out, and greetings from Costa Rica! So, this game is probably more fitting for the “end of the world” theme, but a few graphic adjustments and it’s ready for this LD! Controls and object generation is all done. Now it’s time to handle collisions, scoring, damage and all that jazz. Hopefully it won’t take too much of my time, since I won’t have much tomorrow. Going for it, second time this year! Sound: I have the least experience in this area, so I’ll probably give sfxr a go if I have any time to spare. Since I’ve already got some plans for this weekend it will not be as big as my first effort. But we’ll see how it goes! I’m confident I can have something fun up and running quickly enough. Anyway, greetings from Costa Rica, and good luck to you all! So, since they’re all the rage now and my “conclusion” post right after the development time ran out was pretty short, I thought I’d do a more fleshed out postmortem, so that I could reflect on the experience so far, and put on (virtual) paper what I think I’ve learned from this edition of LD. So, my name is Sergio, and I’m a 23 years old Costa Rican software engineer getting his CS master degree. Even though I do enjoy them greatly, and I’ve developed a couple of demos throughout my career, I’ve never actually embarked on the adventure of creating a game, much less in 48 hours and all by myself! In January I participated in the Global Game Jam, but it was with help from a very skilled team which had let me to play to my strengths and just help out with development. The challenge a LD posed was uncharted territory! “Tiny World” wasn’t exactly the theme I was expecting (to be fair, I wasn’t really expecting anything. I’d glanced at the final round of voting, but didn’t think much of it trying not to settle on anything before the theme was decided); I spent around 2 hours thinking about the theme, throwing ideas around with my girlfriend and brother, and that’s how we came up with the basic idea I would pursue, to which the finished product is actually pretty close. I figured many people would think of the “oversized character moving around a tiny world represented as a circle” mechanic (and I was right), but I figured the specific “destroying cities, eating humans” gameplay would be unique enough to differentiate my game from others, and this being my first LD, it seemed simple enough to be finished by the time the compo ended. I was clear in that I wanted an intro an ending screen to go with the game, and an arcade-ish feel for the actual gameplay. I was pretty happy with this little "collage" I made, showing some of the game's different states. Even though it wasn't a conscious choice, the game looks pretty cartoon-ish, doesn't it? Mostly everything. Using Lua and Love2D allowed for me to do very rapid development; Love2D being insanely intuitive and straightforward, and Lua having a syntax as easy as a syntax can be. I chose Geany as my IDE, being my usual choice for mostly everything I do, and I couldn’t have made a better choice. From there, I went at a pretty stable pace; by the end of the first day (7PM-1am) I had a main character who could walk and jump. By the end of the second day (6am-10pm) I had all of the game’s mechanics implemented and working, and that allowed me to focus the rest of my time on a title screen and an ending sequence, which I think gave a nice level of polish to the final product. Regarding graphics and music: I’m no artist. Graphics were made with Inkscape which allowed me to do clean vectorized assets that at least looked consistent, while the music and sounds were auto-generated and modified slightly using Autotracker-Bu and sfxr, respectively. I don’t think I regret many of my decisions. I should have asked for more feedback from people so that I could realize that bullets being fired from buildings had a sort of “cheap shot” feel to them, and I should have considered shrinking buildings along with the world to make it feel more like the main character was growing, and not that the world was shrinking. Regardless, considering life got in the way of my development time, I don’t think I could have squeezed many more features before it ran out. I think the scope was just right and I planned ahead well enough to get things done by the end of the 48 hour limit. This being my first LD and arguiably my first finished game, I’m extremely proud. It’s gotten a really great reception and received more attention than I could’ve asked for or remotely expected. This has given me a “developer high” and the crave to learn more so I can get better results on my next entries (currently learning HTML5+js); LD is a remarkable testing ground. All in all, a great experience, and I’m already looking forward to the next LD! Well, I must say I’m really, really happy with how this turned out. This being my first Ludum Dare I hadn’t the slightest idea of what to expect (I’d participated on this year’s Global Jam, but I worked with various other very skilled people there), or how I would manage the scope of my selected project. I settled with LOVE2D and Lua about 5 hours before the clock started and I have to admit even though I didn’t have any previous experience with either, both turned out to be wonderful choices. Finally, here are some screenshots. 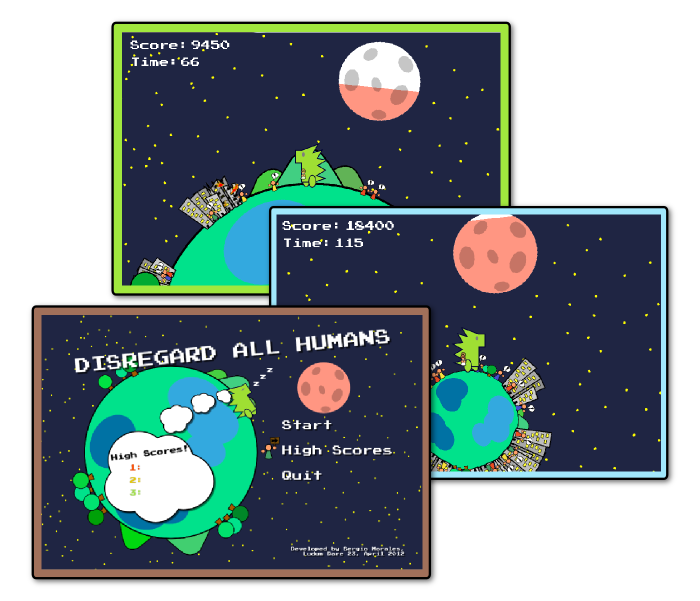 If you want to try my game, click on the image (or right here), and please, enjoy! P.S. See you all next LD! So, this being my first Ludum Dare, I haven’t really found the time to do progress updates (also, I haven’t had all 48 hours to work), but here’s one. There’s around 9 hours left and I’m confident I’ll finish the game 😀 I’m working now on the final details, such as title screen, endgame/credits section, highscores, etc… it’s a good thing I focused on the main game first, or else I’d probably be rushing out features right now. Anyway, here’s how the title screen looks right now, I’m actually pretty happy with it! 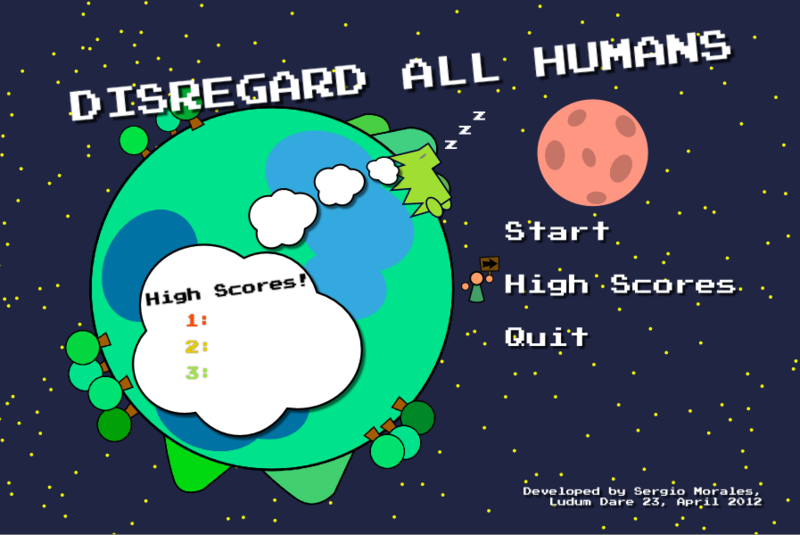 I've called my game "Disregard All Humans"
First Ludum Dare; all systems go! So, after having successfully participated in the Global Game Jam earlier this year for the first time, I set Ludum Dare’s 23rd edition as my next goal. In that occasion I had a great team though, so it’ll be a challenge to adjust the scope from that to a one-man project. Feeling a little experimental I’ve decided to learn Love2D for this event, and I’ve already set up a git repo over at github, as well as a small development environment on the PC I’ll be working on. It’ll be my first time with Lua, but I’m a good learner and I don’t think that’ll be too much of a setback. Greetings from Costa Rica, and good luck to you all! 21 queries executed in 0.084 seconds.